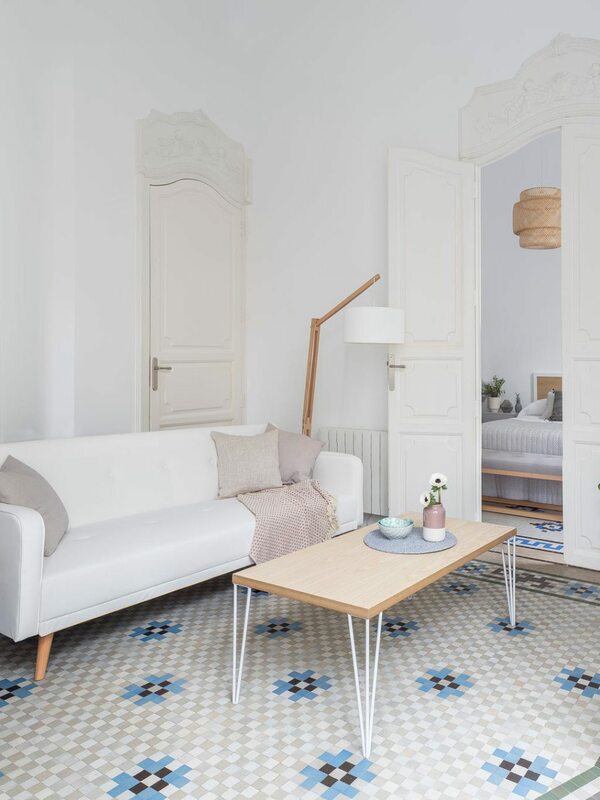 Everything started from this Spanish apartment where the pattern tiles on the floor is a work of craftsmanship adapting to the shape and size of the room and sometimes forming a genuine pattern as would a carpet. This tiles composed for the backstory for a white and grey-beige checkerboard sets the tone for the rest of the decor which on a sober and clear basis punctuates of colorful details. Without going into a so pushed job, one can choose to give strength to the floor of the room by choosing a tiles with geometric or stylist pattern tiles which, while repeating, will give a rhythm to the space. To make this work, it is preferable to stay sober on the walls with a neutral color and coordinated with tiles. For furniture and decoration equally, we will favor simplicity to leave all the space to the floor.